Multitasking, Smoother UI transitions and it wont hang while switching between apps because of its Snapdragon Octa-Core CPU. Don’t worry about battery running out has the Battery lasts up to 17 hours. Oppo A3 uses Mediatek chipset as compared to Snapdragon. It overheats the battery when I play games for more than 2-3 hours. The camera quality are appreciable with lot of settings. I found it quite good. Need to check the battery discharge rate tomorrow. The menu is simple and easy to operate. I got really fantastic deal during the sale. Thanks to compareraja. Very good phone I suggest to my friends this phone is very best for battery backup and camera clarity.Worth it product. Latest price of Oppo A3 in India was fetched online from Flipkart, Amazon, Snapdeal, Shopclues and Tata Cliq. 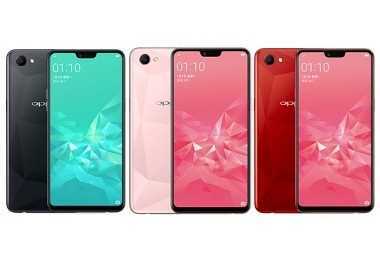 "Oppo A3 with 6.2-inch 19:9 Display Launched in Taiwan"
Launched in July 2018, Oppo A3 is one of the latest models in the showroom of Chinese device manufacturer OPPO. It is stealing the hearts of masses across India and elsewhere with its terrific battery backup and impressive camera. As a significant breakthrough in the growing global selfie trend, this smartphone is termed as quite a blessing! It takes power from Qualcomm Snapdragon 450 Octa Core 1.8 GHz processor and has 2 GB RAM with 16 GB internal storage. Thus, it is a catch for a standard Oppo A3 price. With its smart processor, it is possible to have a great gaming experience. Plus, you can actually extend external memory as far as up to 64 GB with an external SD card. Therefore, if a standard budget, superior view, unique design and classy smartphone is what you are looking for, Oppo A3 could be a perfect choice option. The fact that Oppo phones are well-known all across for their impeccable quality in pictures and selfies is no secret myth. Oppo A3 is no exception. It features 13+2 MP dual rear camera and 8 MP front camera. The rear camera comes with aperture of f1.8 to click great pictures in low light conditions too. It can click fascinating photos and portraits! Plus, the new AI Beauty 2.0 can beautify and adjust each picture with its powerful algorithm. Oppo A3 has an internal storage of 16 GB which you can expand up to 64 GB using an external memory card. There is a separate slot for the same! There is also scope for insertion of dual nano-SIM in different slots. Once you have paid the Oppo A3 price, you are free to marvel at the technological wonders that its strong battery backup can provide you with. Its 4230 mAH lithium-ion non-removable battery allows for long hours of talk time, phone usage as well as a standby of up to 340 hours. You may enjoy without worrying about your charger for a while. With its 15.74cm (6.2") Super Full HD Screen, enter the vast colourful world of Oppo and make your mundane life a bit more vibrant. Its 1520x720 pixels and 19:9 aspect ratio bestows viewing an altogether unique experience. Oppo A3 is a dual nano-SIM accommodation smartphone with dual standby (4G+ 4G). There are also other connectivity options like Wi-Fi, FM, GPS, USB OTG, Bluetooth, Proximity sensor, Compass, Micro-USB, 3G and 4G, no Face unlocking, no Fingerprint sensor, Accelerometer, Gyroscope and others. It operates on the current Android OS v8.1 Oreo that provides a smooth and easy working of all the smartphone applications.